I wanted to use up some potatoes, green beans and tomatoes, and voila. I wouldn't rush to make this again (it was a little plain for that) but I did really enjoy it all the same. Pg. 21. We thought the salad was just pleasant. Yukon gold potatoes and haricot vertes were steamed rather than boiled, potatoes quartered and beans left whole. Grape tomatoes instead of plum. Although the veggies were seasoned as directed I felt the finished salad could definitely use some tweaking, a little more acetic perhaps. Great concept, rather subtle finish as it stands. Great salad. The sweetness of the cabbage really plays well against the briny, salty capers and sharp parsley. I don't think I had savoy cabbage, but it worked well anyway. nice for the summer, good but not craveworthy- must like mustard to enjoy. My favorite pasta cut combined with my favorite tomato sauce = heaven. I'm just surprised I haven't commented sooner. The first time we made it was 10.11.11 and have cooked it from time to time since. A ton of flavor, salty, spicy, buttery deliciousness all with no garlic! We make 1/2 lb and more or less adjust the other ingredients accordingly. Our only tweaks are using clarified butter every now and then, or half butter & half olive oil; and cooking the sauce 5 minutes longer at each step than the recipe instructs. Highly recommend. Easy and delicious, super summery. good. can use other mushrooms to make this. lemon adds nice brightness. London's hot-spot River Cafe has been seducing guests with its completely irresistible renderings of authentic regional Italian food for almost 20 years. 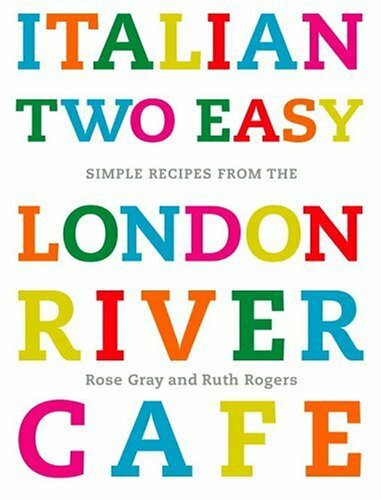 Now, cofounders Rose Gray and Ruth Rogers, bestselling authors of the River Cafe cookbook series, present Italian Two Easy, a follow-up to their immensely popular Italian Easy, sharing 150 additional quick and easy recipes for America's favorite cuisine. With just a small number of fresh ingredients and minimal effort, you can re-create the flavors of Italy in your home kitchen with recipes such as Cucumber Salad with Mint and Mascarpone, Linguine with Clams and White Asparagus, Beef Filet with Red Wine and horseradish, Zucchini Scapece, and Hazelnut Truffle Cake. Organized into 14 chapters, including Really Easy Soups, Salads, Tomatoes Pastas, Roast Meat, Italian Vegetables, and Chocolate and Coffee, the recipes are designed to save home cooks time at the end of a busy day without every sacrificing flavor. From a dozen ways to highlight fresh mozzarella--most ready in a matter of minutes--to instructions for perfect, simply grilled fish, meats, and vegetables, Gray and Roger's Italian Two Easy will help bring your weeknight Italian meals to a new level. Featuring 100 stunning full color photographs illustrating the artistry that goes into each dish, Italian Two Easy makes it simpler than ever to achieve enviable results with the greatest of ease.